Alright, so I might have found a workaround for the users running EIS v10 (currently running v10.0.0.5735) and that cannot check for updates with either Emsisoft Internet Security and Windows Updates. What I did was simple: go in the Control Panel, click on System and Security and then Windows Firewall. 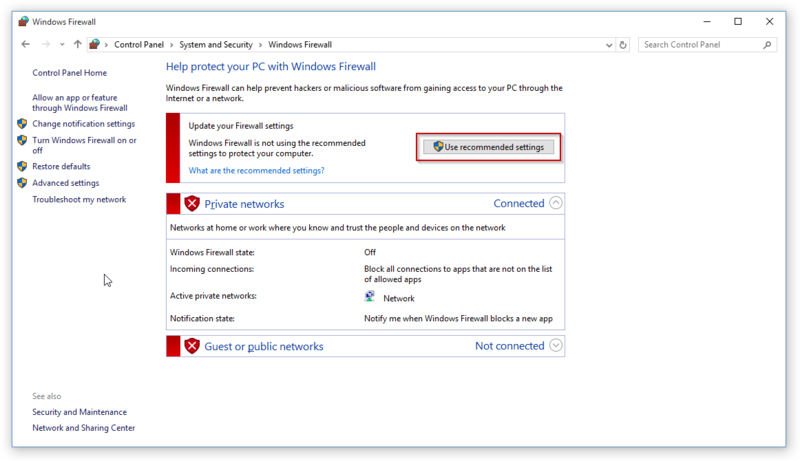 Once in it, click on Use recommended settings for the Windows Firewall (requires Admin Rights). Screenshot is from Windows 10. Once done, it should turn to green, saying the Windows Firewall was enabled. Directly after that, Emsisoft Internet Security updated and asked me to restart the application to update the components, and my Windows Updates managed to check for new updates as well. 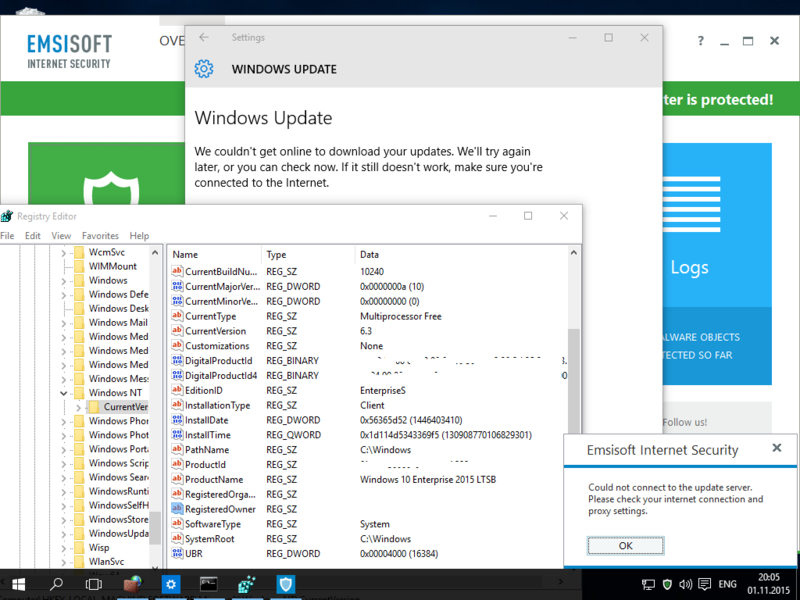 Once restarted, Emsisoft Internet Security was still able to check for updates, so was my Windows Updates, the Emsisoft Internet Security's Firewall was enabled, and my Windows Firewall was back to the settings in the screenshot above (since you're using Emsisoft Internet Security's Firewall). Let me know if that workaround worked for you. If not, I have a few ideas of what we could try next. I have the same problem. I tried your solution, and it worked. But I should do this each time, every day to update my EIS. I don't like to use the Windows Firewall, and I like it to be disabled all the time. When it is disabled my internet connection works for everything except for updates of EIS and Windows 10 updates. Another thing I like to know, if I keep the Windows Firewall disabled, does EIS work or not, does EIS filter the internet traffic or not? Yes, it does. Our firewall relies on our own NDIS and WFP drivers to capture data, which operate independently of the Windows Firewall and its settings. Thank you for posting that. I'll pass it on to the rest of our team. You don't have to do this everytime you need to update your EIS. I did it once, and it both my EIS and Windows Update started working again. What I'll confirm tonight is whether or not you need to do that after a restart or not. If not, it means that this is a one-time thing and could be seen as a "solution" to the EIS v10 vs Windows Update and EIS Update issue. Also, the Windows Firewall will become disabled after EIS restarts since you are using EIS' Firewall so there's no need to worry about using the Windows Firewall here. What I'll confirm tonight is whether or not you need to do that after a restart or not. I expect that it will need to be redone after a restart, however I would be quite happy if I was mistaken about that. I would be as well But it seems that it's because EIS' Firewall and Windows Firewall clashed together and you needed to tell Windows once to use the recommended settings (which would be EIS' Firewall over the Windows one) to get things back in order. Also, is that issue only present with EIS v10 on Windows 10, or also other versions of Windows (if you know about it)? Also, is that issue only present with EIS v10 on Windows 10, or also other versions of Windows (if you know about it)? We're not sure what is causing it yet (it didn't exist when we released the current stable version, so current thinking is it started after a Windows Update). The issue exists on Windows 10 with EIS version 10 (latest stable release) and version 11 beta. There were firewall issues in version 10 (latest stable) on other versions of Windows as well which could have similar symptoms (they were often different for each user, sometimes browsers being blocked, sometimes updates being blocked, etc), however those should be resolved in the version 11 beta. So I just got home and I indeed had to do the manipulation again for Emsisoft Internet Security and Windows Update to work. Something is conflicting but I don't know what, I'll poke around and see what I can find. Wouldn't surprise me if a Windows Update caused that. Do you have the exact release date of the build where this issue started? Do you have to do that little manipulation everytime you restart your computer or not? Also, you have to set the Firewall state (3) to Off, not On (recommended), right? For other question answer is OFF in Public Profile... If is ON then is problem when get update show error "Could not connect to the update server. Please check your internet connection and proxy settings" and not working Windows Updates. Alright good, I'll try it tonight and see how it goes If this is a permanent fix for this issue, it'll help a lot of users here while we wait for v11 to be released. 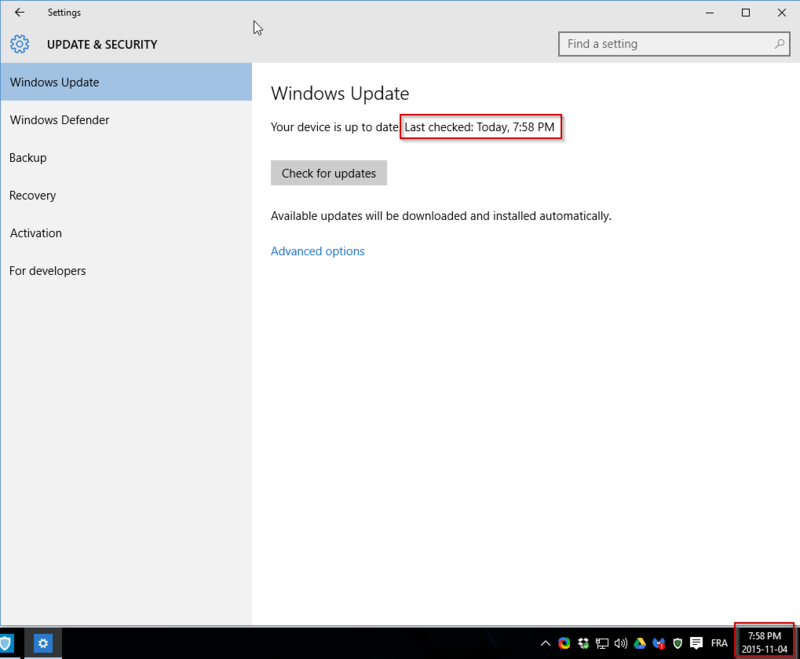 So the Windows Update that could have broke EIS v10 is most likely from the Patch Tuesday that came the week after. It's hard to find information on Windows 10 updates now but I'll see if I can find an update (or the part of a cumulative update) that could have caused this. I think this is a list of the updates, however it's pretty small, and at first glance none of them sound like they could have caused the issue. The most susceptible updates that could have caused this in the list are the KB3096447 and KB3096443 since they directly address the Windows OS (the first one even addressing the kernel). True, but at least theoretically changes to how privileged elevation is handled shouldn't break anything related to networking. Till the developers from EMSISOFT they check see and monitoring what happens between activation and deactivation of the windows firewall and eis in debug mode. What is problem when is on and what is off. Right now I'm fairly certain that we don't change any Windows Firewall settings. I discovered that there is no connection with the upgrades and clean installation of the system has this problem. So installed Windows 10 Enterprise 2015 LTSB system is clean and there are no changes in the settings. Then is directly installed EIS and then not make updates WU and EIS. This issue has been fixed in the latest beta version. If they were caused by the same thing, then yes. I don't think anyone internally was able to reproduce that issue, so we'll have to rely on one of you who were having the issue to let us know if it is fixed. If not, then we will need some debug logs. I could test it tonight before going to bed. I'm going for an hour/an hour and a half, but when I comeback, I can update to the latest beta, test it and if it doesn't work, I can grab some debug logs and post them here. Send the debug logs in a Private Message (if you are able to reproduce the issue). Thanks for taking the time to test this. I'm glad to hear that the beta did indeed resolve the firewall issues. Next maybe I can test the Surf Protection in Microsoft Edge because I see that some users reported that it wasn't working? Other users are reporting that is fixed, however feel free to try it yourself as well. I'm glad to hear that. If you have any feedback about the beta, then please let us know. This problem just won't go away. Running under Win7 x86, EIS v 11.0.0.5886 had been updating reliably for a few days. But today, after four days of non-use (this is no longer my primary OS) I keep getting the dreaded "Could not connect to the update server," even after applying the recommended workaround. I have neither the time nor the inclination to fool around with this any more. Is there a link to beta build 5901 that I can download and install? That recommended workaround have been tested for the latest stable version of EIS v10, not v11 or any of its betas. When I was on v11.0.0.5886, I didn't experience that issue so I don't think I can find a workaround for you. If you uninstall EIS, then reinstall it and enable the beta updates, you should be upgrading to build 5901 right away. ... Is there a link to beta build 5901 that I can download and install? Ask in the tester forum. Frank or one of the developers can let you know if we have an installer you can use.